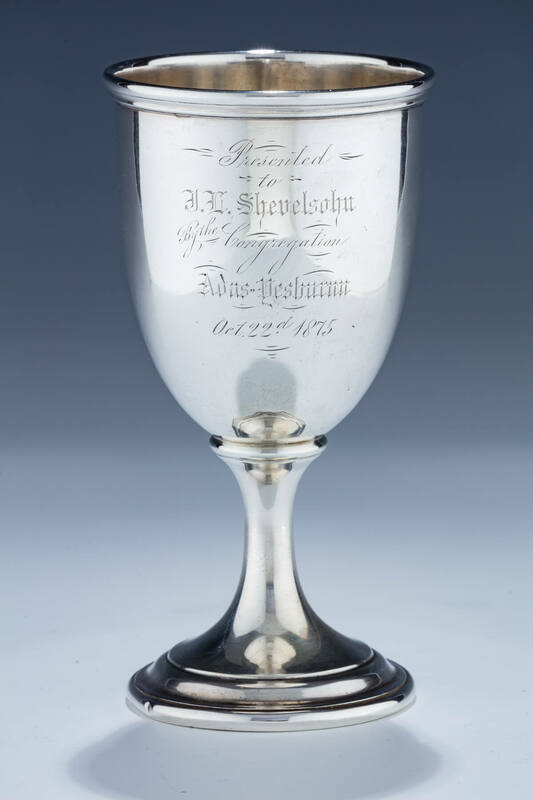 A RARE AND IMPORTANT STERLING SILVER KIDDUSH CUP BY GORHAM. Providence, Rhode Island, 1875. On round base. With large upper portion. Engraved with dedication: “PRESENTED TO I.L. SHEVELSON BY THE CONGREGATION ADAS YESHURUN, OCTOBER 22, 1875.” Marked with Gorham insignia, Sterling and date mark of H (1875). Founded in 1872 in Syracuse, New York, Congregation Adas Yeshurun was originally a breakaway minyan from the Congregation of Kadischa, also known as the Neustadter Shule. I.L. Shevelson served as the first president of the new congregation. The first building was at 75 Mulberry Street. 6.4” tall.